Have you ever read something that changed your life? You connected with it and it made you feel something so powerful that you can’t remember how things were before. Words can do that. They can change the way you think; they can change the way you feel; they can change you. Words are probably one of the most powerful tools we have. Sure, money is great, power is great, technology is great. But not everyone has money, power, and technology. But even without these things, if you have words then you have so much more. As a writer it still amazes me that everything I do is just different combinations of 26 letters. That on their own these words don’t mean much, but put together they have the ability to influence something. Words can literally change how a person sees something. Imagine you’re reading a book and you see: ‘The girl was mad.’ Alright, but how mad is she? Change it to: ‘The girl was furious’ or ‘The girl was livid’ and you suddenly get a much clearer image of the girl. Even without describing what she actually looks like, it is much easier to picture someone ‘furious’ or ‘livid’ rather than ‘mad’. By changing one word you have changed the entire meaning and given the reader more to think about: Why is she furious? What made her so livid? Words can change everything. They have the power to influence you and those around you. Without words the world would be an incredibly dull place. Have you ever read anything that changed you? 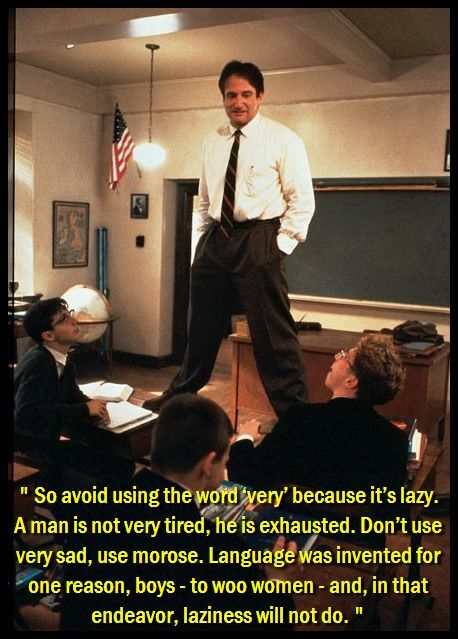 I would just like to say thank you to Robin Williams. 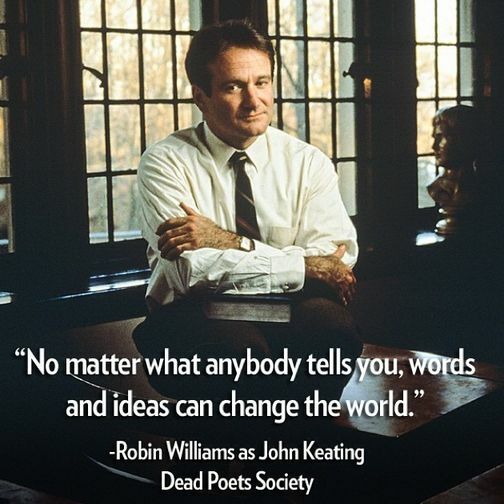 Growing up, his films were a huge part of my childhood and the Dead Poet’s Society changed me. His performance in this film forever changed the way I think about literature and the way I write. May he rest in peace.